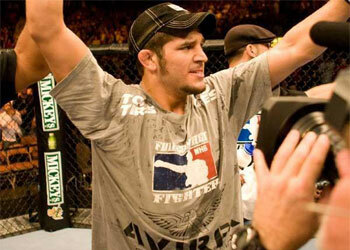 Despite being sidelined for the past six months due to a knee injury, UFC middleweight Patrick Cote has just inked a four-fight contract to remain with the organization. MMAWeekly.com confirmed Cote’s employment status with sources close to the negotiations. Cote tore the meniscus and medial collateral ligament in his right knee in the 3rdRound of his title bout against champ Anderson Silva. At the time, it was the deepest anyone had taken the champ inside an Octagon. The French-Canadian immediately fell to the canvas, bringing the UFC 90 fight to its conclusion. Although he ended up “losing” the scrap, he earned a lot of respect from his peers for challenging the “untouchable” champ. His recovery time period has been moving at a snail’s pace, but he is eying a return to the Octagon later this summer. Cote currently holds a 13-5 professional MMA record, however has only mustered up a 4-5 mark inside the Octagon.